Toyota launches high-spec Aygo Go! 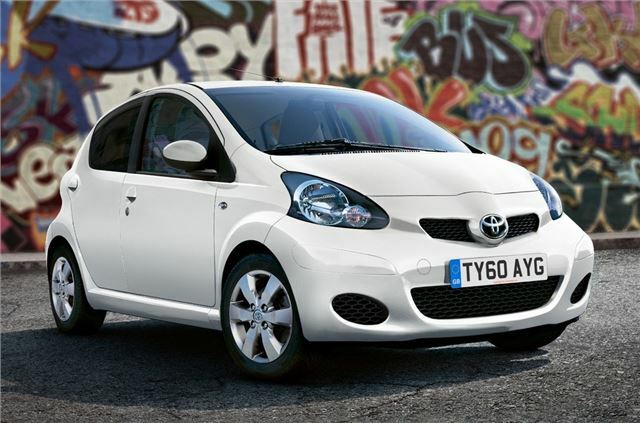 Toyota has launched a high-spec version of its city car - the Aygo Go! It comes with a removable TomTom satellite navigation unit that has touch screen controls and a voice recognition function. It also features clever extras and can tell what the weather will be like when you arrive and flag up points-of-interest along the way - including filling stations. The sat-nav comes along with Bluetooth and a USB port for connecting iPods and other digital music players to the audio system, which itself provides a CD player that can play MP3 files from disc. The 4.3-inch navigation screen offers a bird's eye route view and can also display playlist and album details and SMS messages, with a handy speech-to-text facility if required. The Aygo Go! gets other extras too including new-design alloy wheels, dark-tinted rear privacy glass and a leather-trimmed steering wheel. New exterior colours are Chilli Red and Cirrus White, with metallic Carbon Quartz available as an option. Air conditioning can also be specified, together with the dedicated Aygo Style and Protection option packs. The Aygo Go! is available in both three and five-door body styles and is powered by the ultra-frugal International Engine of the Year award-winning 1.0-litre three cylinder VVT-i petrol engine with manual or MultiMode transmission.